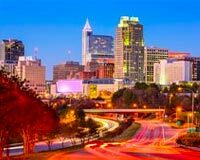 Along with Durham and Chapel Hill, Raleigh anchors the Research Triangle, a metropolitan area with more than 1.3 million people. 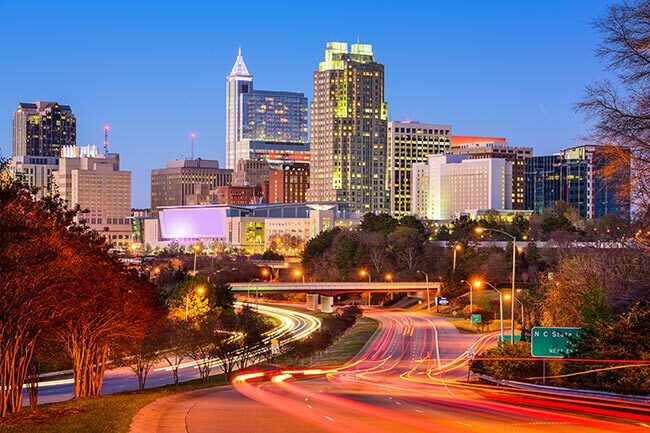 This region is home to North Carolina’s most innovative businesses, ranging from manufacturers to technological developers to healthcare facilities to educational institutions. Each of these industries has distinct supply needs, making it essential for local carriers to offer tailored services. ExpeditedFreight.com provides just such tailored solutions, keeping Raleigh connected not only to the rest of North Carolina, but to all of the US and Canada. Raleigh and the rest of the Triangle’s wealth and vibrancy is made possible by the range of advanced industries offering quality jobs to residents of all skill levels. Consider the local automotive industry. Countless automotive producers have set up facilities in the Triangle area, including Freightliner, Caterpillar, and Aisin AW. These businesses offer a steady source of jobs for the local population, allowing everyone to make a living and benefit from the region’s strong growth. Even as Raleigh’s producers create jobs and wealth, they also face serious shipping problems. Automotive producers and other local businesses need a cornucopia of supplies, many of which are difficult to get and risk being damaged along the route. Given that many Triangle companies operate on tight schedules and cannot use damaged supplies, meeting their logistical needs is a content struggle. ExpeditedFreight.com eases this struggle, offering quality logistics for North Carolina’s most advanced producers. We serve the entire Triangle Area, including Raleigh, Durham, and Chapel Hill. We also supply other metropolises in the region, including the Greenville and Rocky Mount areas as well as Winston-Salem, High Point, Greensboro, and the rest of the Triad. Whether we are traveling into, out of, or between these areas, we consider every possible route, choosing the one that exposes us to the least weather, traffic, or road damage. This way, we can complete your delivery at top speed without putting your items at risk. We watch the roads ahead, looking out for congested traffic, inclement weather, and other factors that might delay the vehicle or damage the inventory it’s carrying. If we detect any such developments, we guide our drivers around them, keeping your order on schedule while minimizing any risks it might encounter. ExpeditedFreight.com relies on a team of skilled, safe drivers. To help these professionals do their jobs safely, we send them out in teams of two, requiring them to switch between driving the vehicle and getting rest. Both drivers are thus sufficiently rested to watch the road and stay safe, as well as to react quickly to any new instructions we send them. When you trust us with your order, we give you all the information you need during and after the delivery process. Simply call our customer service center and we can answer your questions, tell you your vehicle’s location, or offer free estimates on future orders. For more information on ExpeditedFreight.com and our deliveries in the Triangle and across the United States, contact us today at (919) 800-0339.